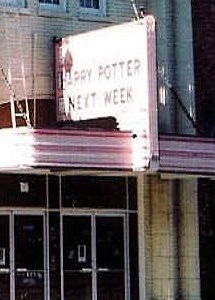 The Rialto Theatre in Deer Lodge is the cultural center of Powell County, Montana, a significant architectural structure in western Montana, and an important part of the daily lives of area residents. It is listed on the National Register of Historic Places and is an anchor of the downtown business district. As the only auditorium in the county the Rialto is used for all local school plays and concerts, dance recitals and comedy shows, community plays and repertory productions, conferences and civic events, affordable current movies on weekends, funerals and other events. 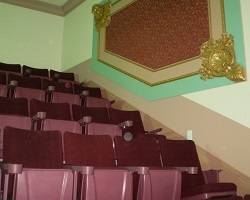 Here is a view of seating in the balcony after construction was completed in 2012. The paint scheme and the layout is similar to what was in place before the fire in November of 2012. The decorations on the lower right and upper left of the panel in this picture, were laboriously reconstructed by items that survived the fire. This is the result of the ticket booth area having been taken apart piece by piece by local wood artist Cody Neubauer and minutely reclaimed from what was left of the ticket booth. 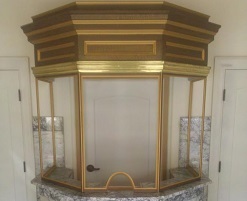 The marble panels for the whole ticket booth area also were removed, cleaned and reassembled. In addition, Mr. Neubauer recreated the woodwork in the whole lobby area.